Labour chief fundraiser Lord Levy told a businessman he need not tell a Lords vetting committee about his loan to the party, BBC News has learned. 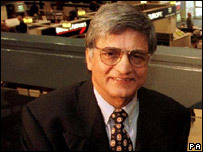 Entrepreneur Sir Gulam Noon, who lent £250,000 to Labour, had been nominated for a peerage. Lord Levy's advice prompted Sir Gulam to retrieve nomination papers already sent to Downing Street for forwarding to the Lords Appointments Commission. That was because the papers mentioned the £250,000 as if it were a gift. BBC business editor Robert Peston says the disclosure is another example of the cloak of secrecy put by Labour around loans it had been receiving from wealthy individuals. Scotland Yard is conducting a wide-ranging investigation into loans and donations made to all three parties and also into whether honours have been given as rewards for financial help. Sir Gulam - known as the Curry King because he made a fortune manufacturing chilled Indian meals for supermarkets - signed an agreement on 20 April 2005 to lend Labour £250,000. He paid the funds on 28 April. WHAT HAD TO BE DISCLOSED? The commission will wish to be aware of any donations - both in money or in kind - to political parties that were declarable to the Electoral Commission under the terms of the Political Parties, Elections and Referendum Act 2000... the Commission will also want to be informed of any personal financial relationship between you and a senior member of a political party. According to a businessman, Sir Gulam had originally offered to make a donation of between £50,000 and £75,000 but Lord Levy wanted £1m. They then negotiated a loan, rather than a donation. There is a dispute about whether the loan was Lord Levy's suggestion or Sir Gulam's. Sir Gulam eventually agreed to make a loan on allegedly commercial terms. Labour and the Tories have both been given legal advice that loans made on commercial terms did not have to be made public, unlike substantial donations. A letter sent to Sir Gulam at this time by Labour said that his £250,000 loan was not "reportable" under relevant legislation. Labour was in dire financial straits in early 2005. The general election was imminent and the party wanted cash to help fund its campaign. Just over five months later, on 3 October, Sir Gulam received a call from Ruth Turner, Tony Blair's director of government relations and a Labour official, telling him the prime minister was nominating him for a peerage. The following day, 4 October, Sir Gulam received the nomination forms for joining the House of Lords. These asked him to list his donations to political parties. Sir Gulam gave the papers to his accountant, who put down the £250,000 loan on the form along with just over £220,000 of direct donations he had made since 2000. The completed forms were then sent to Richard Roscoe, a civil servant at 10 Downing Street, for forwarding to the Lords Appointments Commission, which is chaired by Lord Stevenson. However on 5 October, Sir Gulam and Lord Levy had a telephone conversation. In the course of the conversation, Lord Levy told Sir Gulam that he need not have included the £250,000 loan on the papers sent to the Lords Appointments Commission. He said this was because the £250,000 was a loan, not a donation, and was therefore did not have to be disclosed under the law. Sources close to the Lords Appointments Commission have told the BBC that other nominees for peerages have disclosed their loans to the Commission. Sir Gulam then telephoned Mr Roscoe and asked if he still had the papers or whether they had already been passed to the vetting committee. Mr Roscoe said he still had them. So Sir Gulam retrieved them and submitted a revised document that made no mention of the £250,000. In March this year, the Lords Appointments Commission found out about the loan made by Sir Gulam. Its chairman, Lord Stevenson, then wrote to the prime minister asking that Sir Gulam's nomination for a peerage be withdrawn. Although the commission's members accept that the failure to tell them about the loan may have been a simple mistake by Sir Gulam, they felt it was inappropriate for him to receive a peerage so soon after he gave financial help to Labour. However, they did not rule that he was not fit and proper to be a peer and might accept his nomination for a peerage if it were resubmitted at some point in the future. A friend of Lord Levy - who has raised millions of pounds for Labour and is a close confident of Tony Blair - says Sir Gulam and Lord Levy are not particularly close. Until Sir Gulam made the loan, he had made his donations independently of Lord Levy's fund-raising efforts. BBC political editor Nick Robinson says there was no proof that the law or the rules had been broken. But questions would be asked about Lord Levy's advice when Sir Gulam was willing to declare details of his loan and the Lords vetting committee would have liked to hear about it. 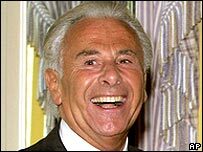 In an interview with BBC Radio Five Live, Sir Gulam refused to confirm that Lord Levy was the Labour official who suggested the money should be a loan. "I knew it was a loan, simply a loan, it was not a donation," said Sir Gulam, explaining Labour had made clear he did not have to declare the money under the law. Sir Gulam denied haggling over the amount of the loan and said he felt "hurt" that the loan had been blown "out of proportion". "I have done nothing wrong," he said. "My conscience is clear. I gave the loan and when I filled in a nomination form I did declare it." Norman Lamb, Liberal Democrat leader Sir Menzies Campbell's chief of staff, said: "The proximity with which Lord Levy operates to Downing Street means that these reports raise serious questions for the prime minister and the Labour party as a whole." A Labour Party spokesman said: "These matters are subject to an ongoing police investigation and therefore we have nothing to say."